The Ashmolean Museum’s holdings of Indian art are the most extensive in this country after the great London collections of the British Museum and the Victoria and Albert Museum, but they have not been widely known hitherto except through the publication of such famous masterpieces as the Tamluk terracotta [see EAX.201] or Abu’l Hasan’s drawing after Dürer [see EA1978.2597]. 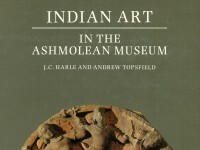 Our purpose in selecting objects for description in this handbook has been to provide an illustrated survey for visitors to the Museum’s Indian galleries, reflecting the range and particular strengths of the collection, while also incorporating information and discussion of interest to scholars. We are greatly indebted to Mr. Neil Kreitman for generous funding without which this book could not have been produced in anything like its present form. We also wish to thank many colleagues who assisted our work, including: Dr. F.R. Allchin, Dr. Mildred Archer, Mr. Douglas Barrett, Dr. G. Bhattacharya, Shri Lakshman Bhojak (L.D. Institute of Indology, Ahmedabad), Professor P. Chandra, Mr. M.A. Dhaky, Mr. Simon Digby, Mr. Toby Falk, Ms. Tapati Guhathakurta, Dr O.R. Impey, Mr. Jonathan Katz, Dr. Simon Lawson, Professor T.S. Maxwell, Dr. Partha Mitter, Miss Veronica Murphy, Mr. Michael O’Keefe, Dr. M.S. Nagaraja Rao, Mr. Robert Skelton, Dr. John D. Smith, Miss Susan Stronge, Mr. Gerald Taylor, Miss Betty Tyres. Miss Catherine Mortimer of the Laboratory for Archaeology and the History of Art, Oxford, made the metal analyses by X-ray fluorescence (XRF), Mrs. Geraldine Beasley of the Museum’s staff undertook the photography, Mr. Bruce Graham helped with revision and editing and checked the inscriptions, and Miss Nora Addison typed the manuscript. D. Barrett and B. Gray, Indian Painting, repr. London, 1978. B. Gray ed., The Arts of India, Phaidon, Oxford, 1981. J.C. Harle, The Art and Architecture of the Indian Sub-Continent, London, 1986. S.L. Huntingdon, The Art of Ancient India: Buddhist, Hindu, Jain, New York etc., 1985.